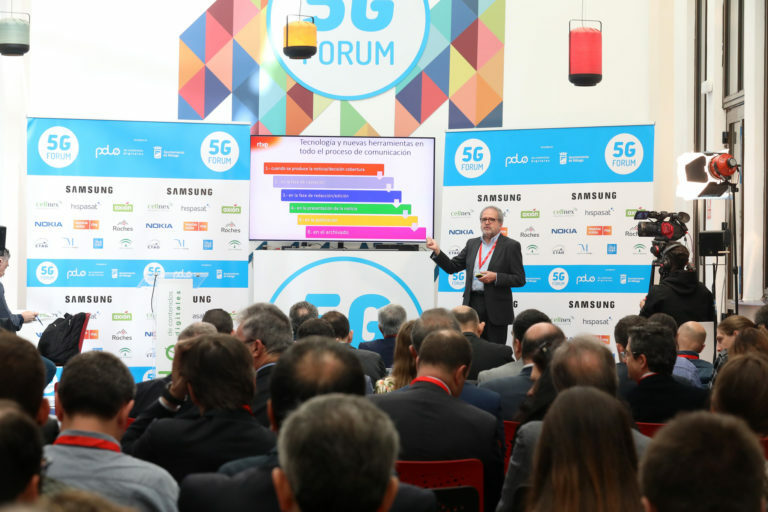 The influence that 5G will have on televisions will be one of the main thematic focuses of the 5GForum in Malaga, the most relevant event in Spain specifically on this new technology. The 5GForum will be held on April 24 and 25 in the Digital Content Hub of the capital of the Costa del Sol, this is its second edition, and the main experts, companies, multinationals and pilot projects from more than 20 countries will come to share their experiences. Multinationals such as China’s Huawei and Germany’s Rohde & Schwarz will focus their keynotes at the 5GForum on their advances in 5G for televisions. David Cáceres, head of Cloud Solutions for Western Europe in Huawei, will present the new working formulas that will be created for companies in the media sector with the development of 5G technologies, and will explain the proposals that the multinational has already tested “from beginning to end”. China, in the opinion of experts, is the most advanced country in the new 5G technology, followed by the United States. Europe is behind them, although Germany is the most advanced European country. The engineer Mohamed Aziz Taga, main expert of the 5G for the Broadcast of the German multinational Rohde & Schwarz, will come to the 5GForum from Germany. Taga, of Tunisian origin, will explain his proposal for the live broadcast of multimedia content by deploying an HPHT (High Power Hight Tower) topology as an overlay. In this way, the distribution of multimedia and entertainment content, in Taga’s opinion, will be more efficient and profitable. The European Broadcasting Union (EBU) conference will also address opportunities for broadcasters. Croatian engineer Darko Ratkaj, EBU Senior Project Manager, will be responsible for explaining what major European public broadcasters are doing to take advantage of the extraordinary possibilities offered by 5G. The EBU currently has 71 members (including radio and television stations) from 56 countries. On the part of Radio Televisión Española, Pere Vila, Director of Technology, Innovation and Systems, will share the advances being made by Spanish public television in relation to 5G and 4K, the possibilities of editing in the cloud and transmitting content, with significant savings in time and money. In addition, the Ministry of Economy and Business, through Antonio Fernández-Paniagua, will explain the measures foreseen in the National Plan of the 5G, which will force to change frequencies to all television channels, public and private, national, regional and local. Fernandez-Paniagua will participate in the 5GForum just the day after an important meeting on the 5G convened by the European Commission in Brussels. In this way, the role that the 5G will play on televisions worldwide will be one of the topics that the 250 exclusive attendees of the 5GForum in Malaga will be able to get to know first hand.